2. To highlight the installation issues I faced and how I got around them so that anyone else facing the same can benefit. 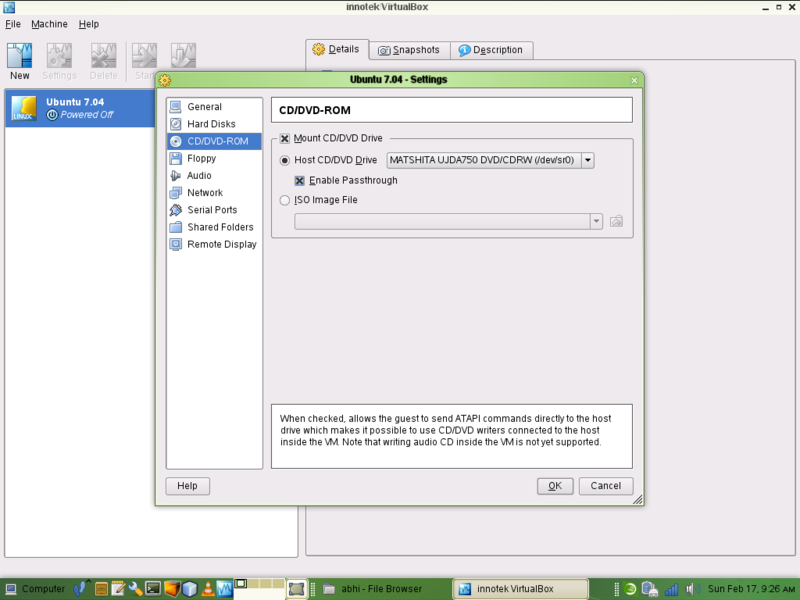 Selecting previously unselected package cdh4-repository. 0 upgraded, 9 newly installed, 0 to remove and 119 not upgraded. Need to get 70.1 MB of archives. After this operation, 82.3 MB of additional disk space will be used. Selecting previously unselected package libopts25. Selecting previously unselected package hbase. 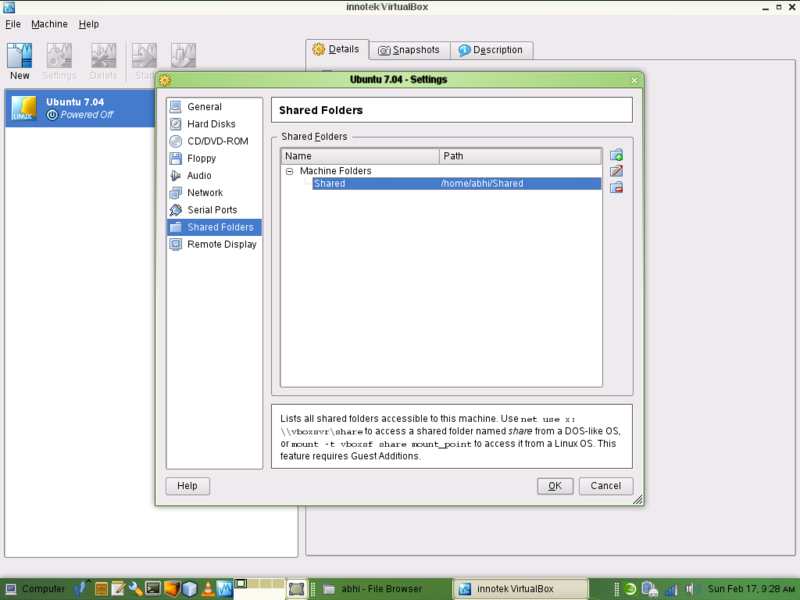 Selecting previously unselected package hbase-master. update-alternatives: using /etc/zookeeper/conf.dist to provide /etc/zookeeper/conf (zookeeper-conf) in auto mode. 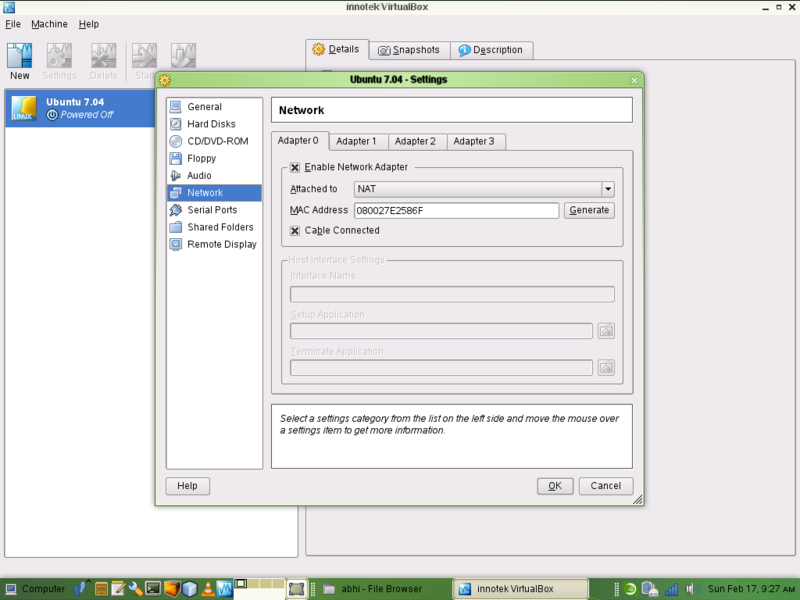 update-alternatives: using /etc/hadoop/conf.empty to provide /etc/hadoop/conf (hadoop-conf) in auto mode. update-alternatives: using /etc/hbase/conf.dist to provide /etc/hbase/conf (hbase-conf) in auto mode. 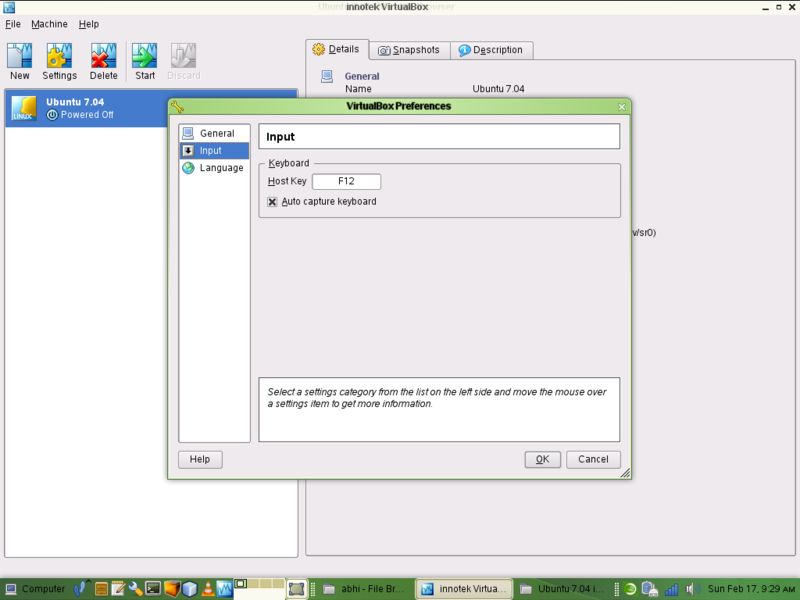 invoke-rc.d: initscript hbase-master, action &quot;start&quot; failed. I got the above error the first time so I checked if JAVA_HOME is set properly. hbase is already the newest version. hbase-master is already the newest version. This time everything went well. View the list of HBase configuration files. Lets invoke the HBase shell and test. Here I encountered the second issue. For some reason the HBase shell would hang. After googling around for quite some time I found a fix. 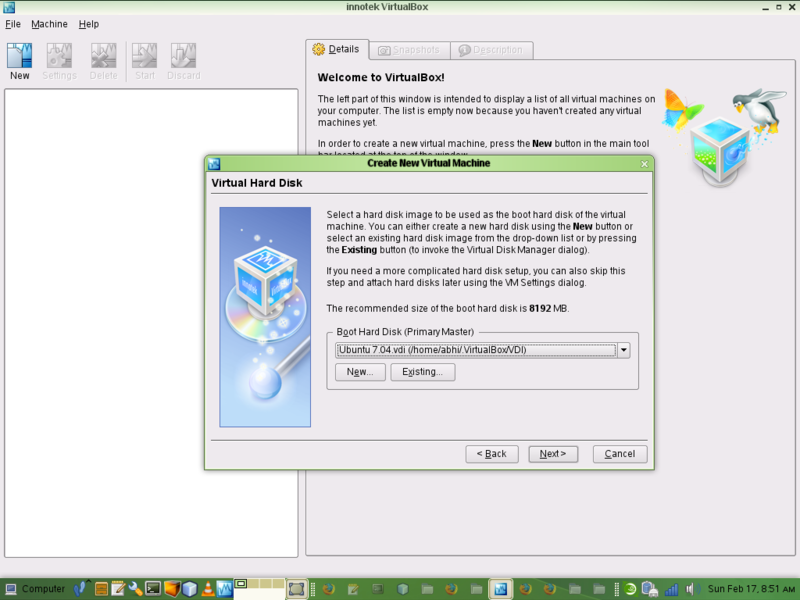 Although we are able to play around with HBase – create tables, put and get data etc. the data will get deleted once we restart the system as it is transient. In the stand-alone mode everything is executed within a single Java process and the data/files get stored under /tmp by default. Most OS clear /tmp on reboot thereby removing all the data. To make the data persistent we need to edit the hbase-site.xml file and set the root directory. 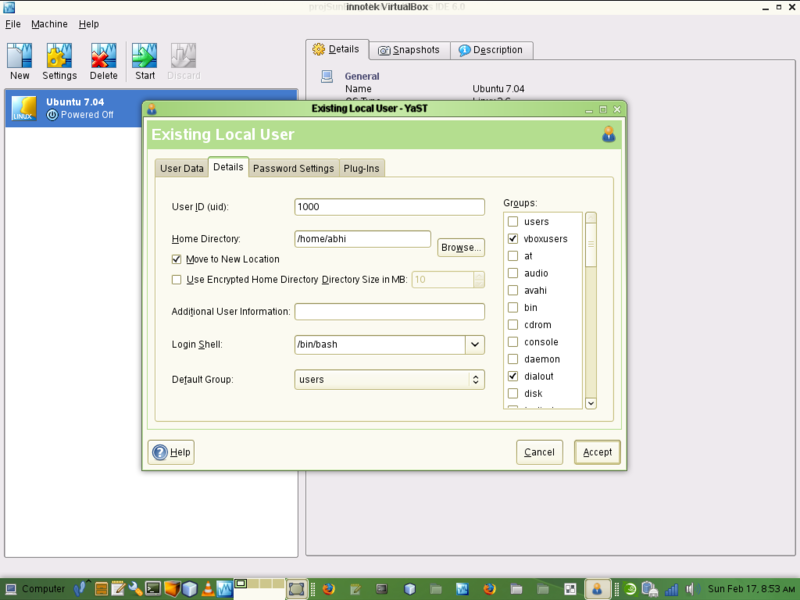 Now when you create tables and enter data, the data will persist even after system restart. Lets create a table and enter data. Note: Always do a flush on your tables so that the data gets written as files in your filesystem. In my next post we’ll see how HBase persists the data physically on the filesystem as files and directories. 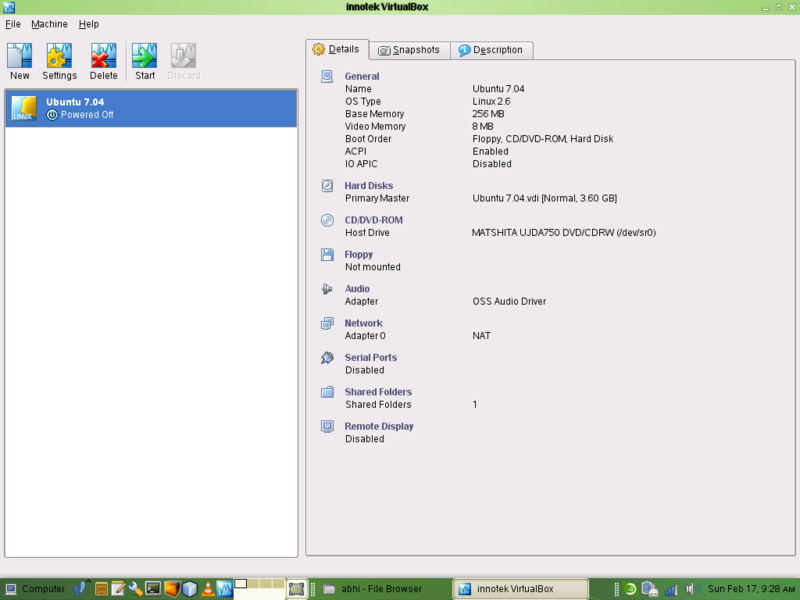 I’ve been struggling to install PostgreSQL Server 8.4 on Ubuntu 10.04. I created a new user “postgres” using the Users Settings Tool (System > Administration > Users and Groups) and tried to install the PostgreSQL database server and pgAdmin III tool using the “Software Update Center”. Although the server seems to have been installed, I was unable to start it. I tried the instructions mentioned at – https://help.ubuntu.com/community/PostgreSQL to no avail. Anyway, since I had to create a small Proof-Of-Concept for a project I’m working on, I really wanted to install PostgreSQL as the database. 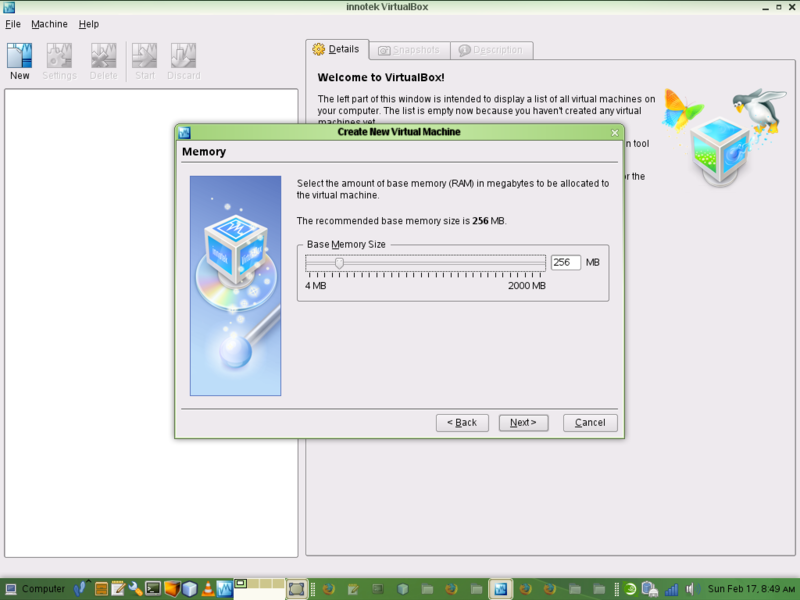 This was much simpler and I was able to install the server and all the necessary tools in less than 10 minutes. 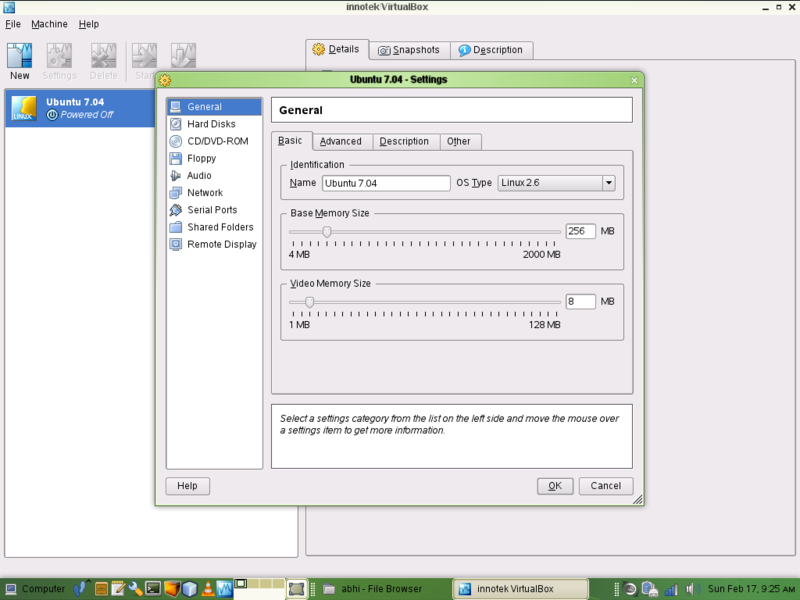 I now have a nice PostgreSQL 8.4 Menu under the Application Menu with a number of options viz. start server, stop server etc. These menu items along with the pgAdmin III tool definitely make working with PostgreSQL lot easier. Ubuntu has definitely been developed keeping user experience in mind and one of the ways it tries to do so is by cleverly keeping “root” out of the picture. You work with only one user account – one that was created during the installation process. Unlike other Linux distros where during installation you specify a root password, in Ubuntu you are prompted to create a regular user (as opposed to root) and you specify a password for that user. The root user does exist but one cannot explicitly log in as root. 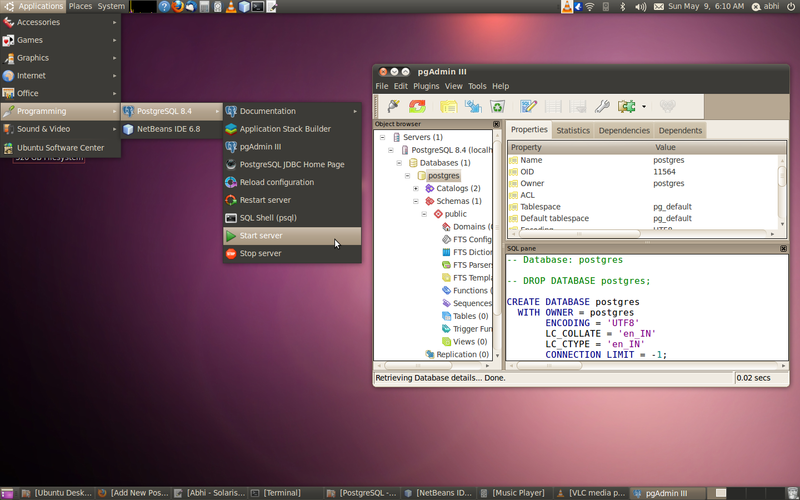 Ubuntu 10.04 Lucid Lynx rocks! I’ve been using openSUSE for quite some time now. 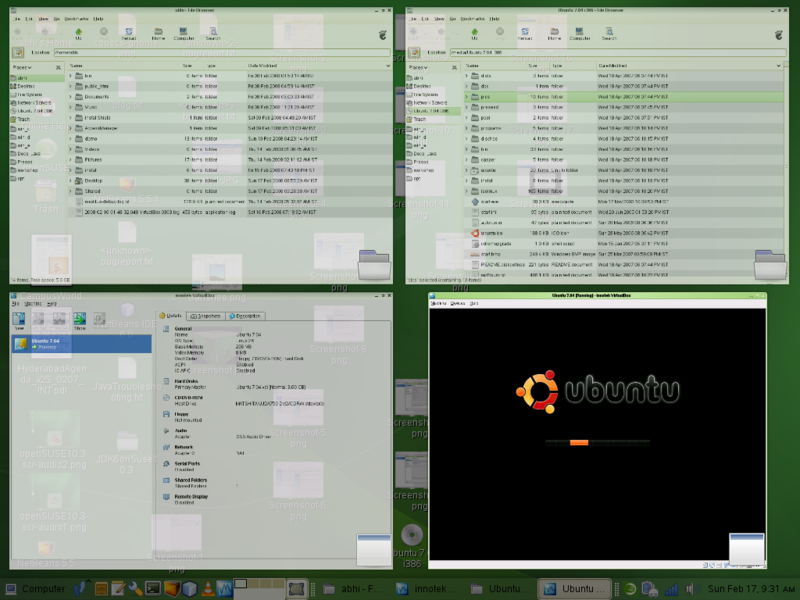 Barring the ubiquitous driver issues that plague all Linux distros I’ve not had much to complain. Over the last two years or so Ubuntu has been picking up steam.. at least the community seems very active. 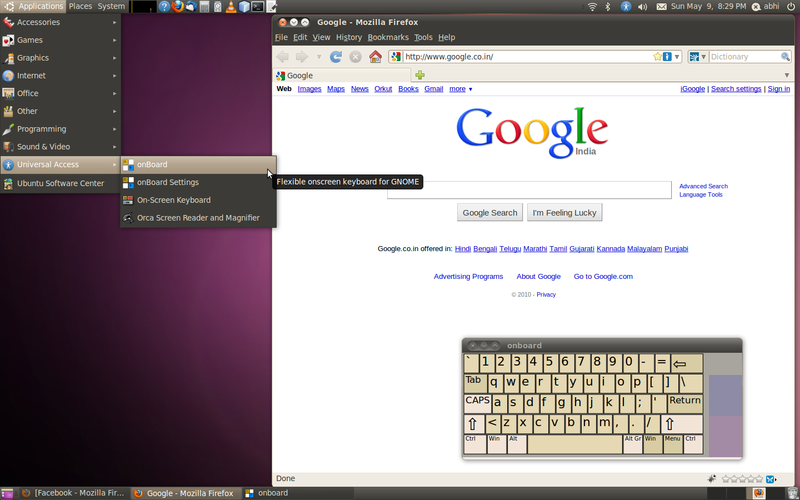 So I went ahead and downloaded the latest release – Ubuntu 10.04 Lucid Lynx. 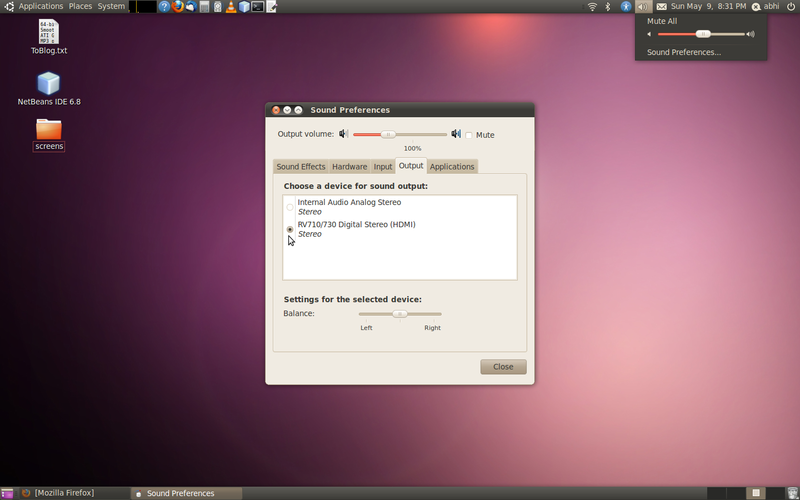 I opted for the 64-Bit Desktop Edition (ubuntu-10.04-desktop-amd64.iso). The installation was super easy and was quite fast. 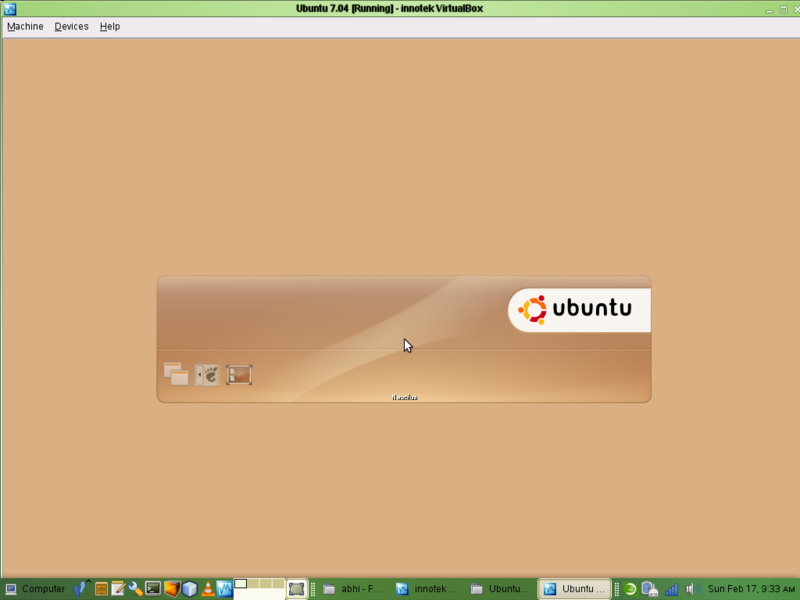 Everything just worked fine – Graphics (Compiz), Sound, Webcam etc. It also gave me an option to use the proprietary driver for my ATI Radeon graphics card. 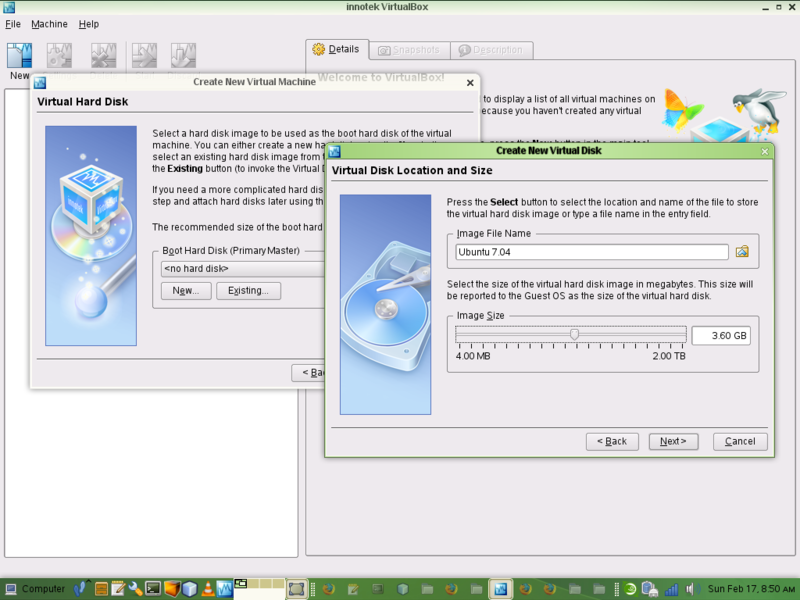 I installed the ATI drivers and then configured Compiz cube and other visual effects. 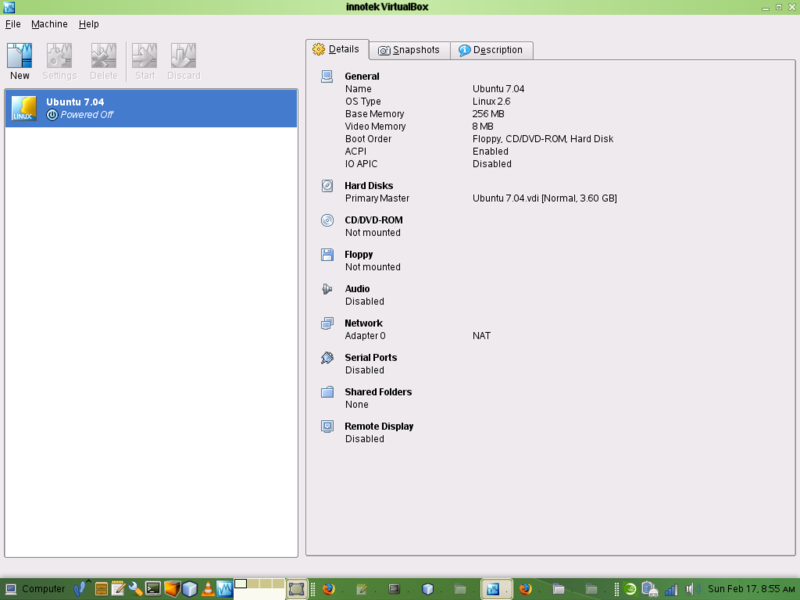 Installing drivers or any other software for that matter is really simple on Ubuntu. I love the “Ubuntu Software Update Center”. 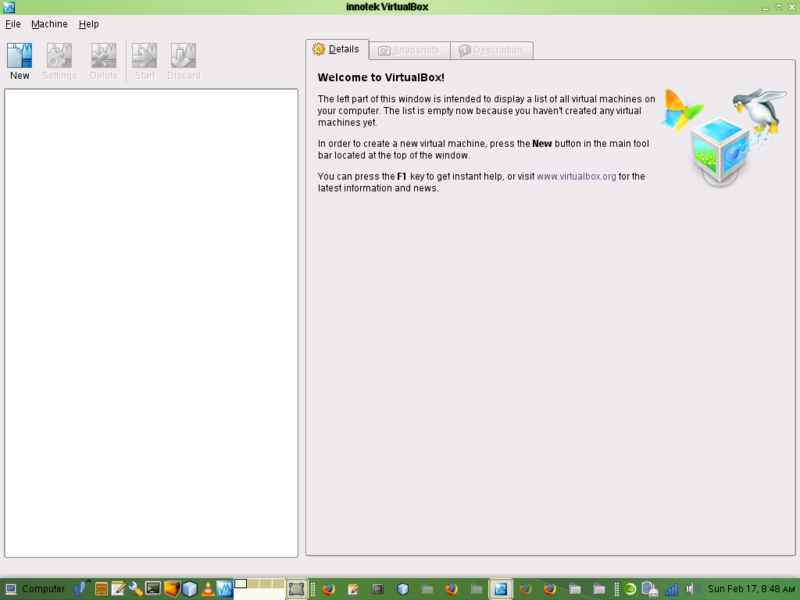 I immediately downloaded Mozilla Thunderbird, VLC Media Player and few other must have utilities. When I invoked Rhythm Box to play some songs it immediately prompted me to install the MP3 plugins. A button click and my MP3 plugins were installed. 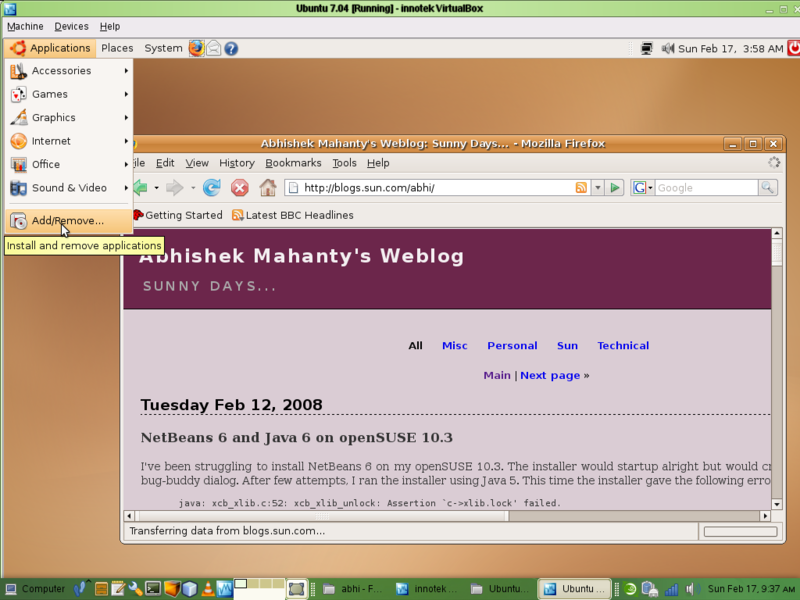 Installing JDK and NetBeans was fairly straightforward as well. Mozilla Thunderbird works fine but I ran into issues trying to install the calendar plugin – Lightning. There seems to be some issue with its 64-bit version and lot of other folks been struggling with it too. VirtualBox, I decided to check it out. 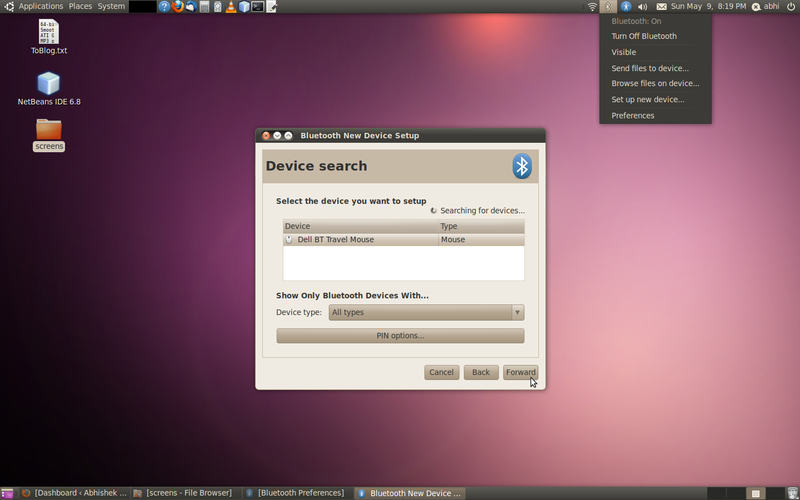 within minutes I was able to install Ubuntu 7.04 as a guest OS on my openSUSE. 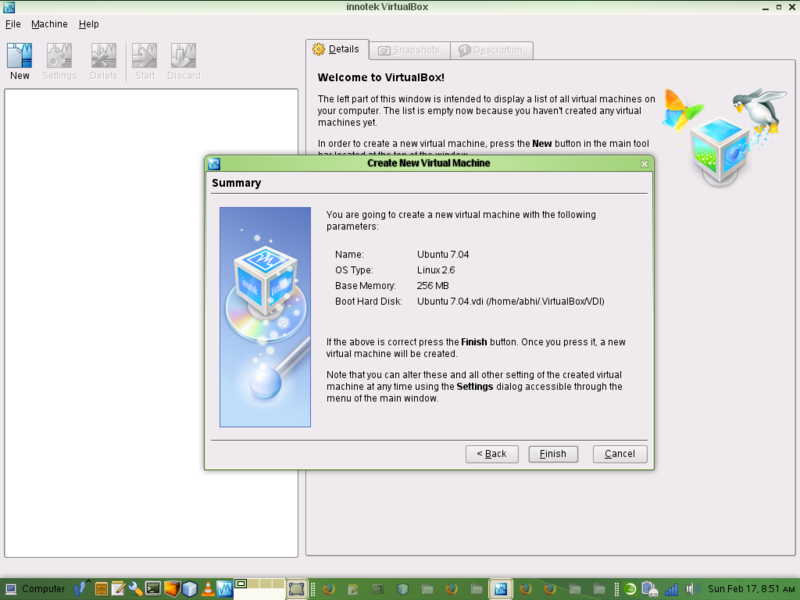 The Virtual machine gets created successfully. 5. Modify settings – CD/DVD ROM, Shared Folders etc. 6. 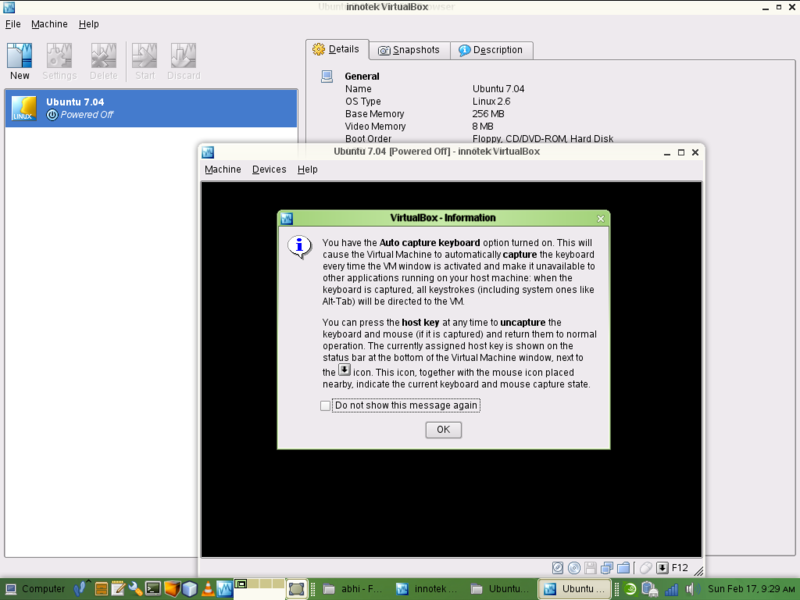 Configure host key in preferences – F12 in this example. 7. 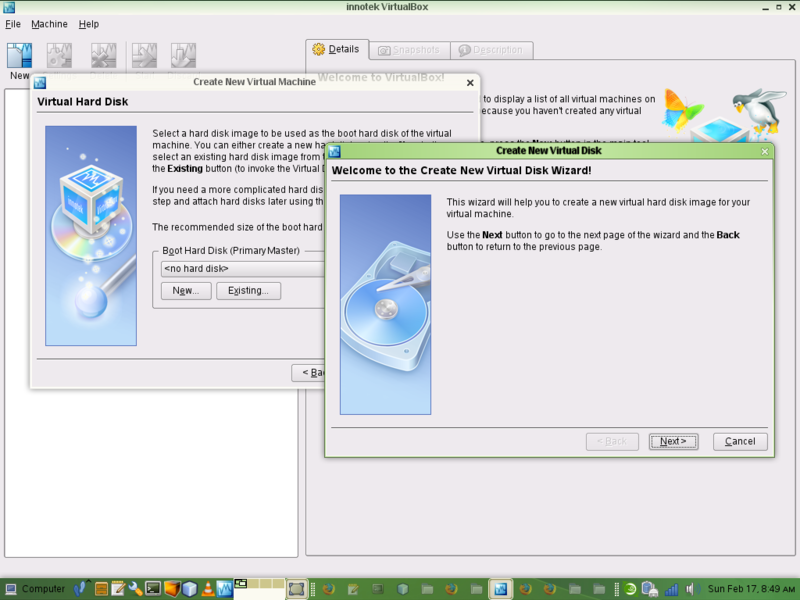 Insert the guest OS installation DVD in the drive and start the virtual machine. 8. 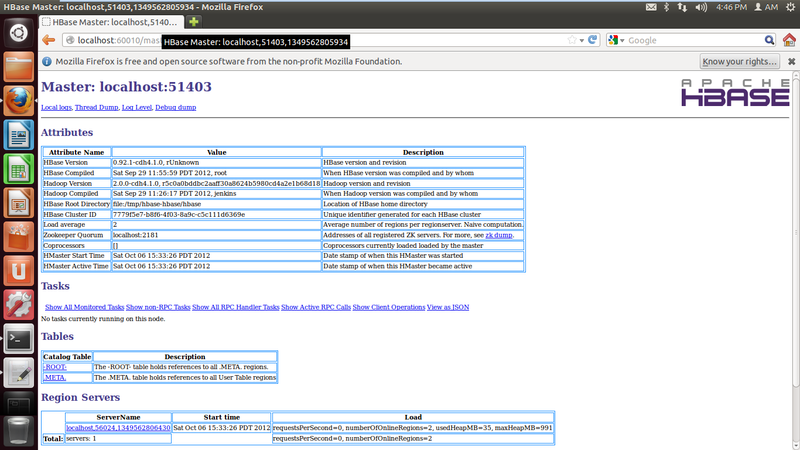 Accessing the web from the guest OS. Note: To run the guest OS in fullscreen mode press [hostkey] + F i.e. F12+F in this case.